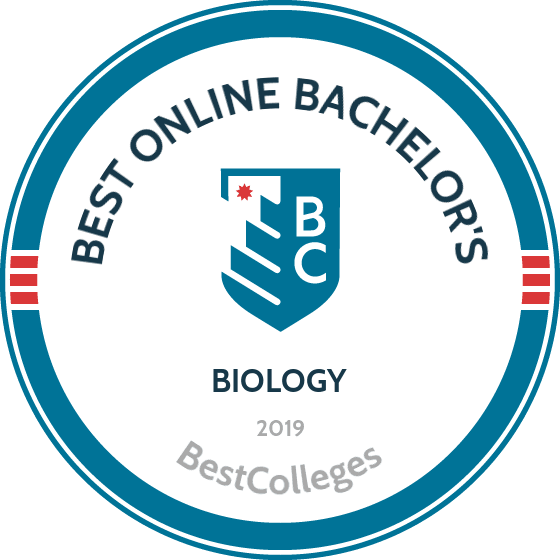 What Are The Best Online Bachelor's in Biology Programs? What Else can I Expect from an Online Bachelor's in Biology Program? Biological science is one of today's broadest and most important areas of scientific research. In addition to being an exciting and multifaceted discipline for students interested in the study of life, it's also an incredibly popular undergraduate major, conferring one of the largest numbers of degrees. Earning an online biology degree prepares you to conduct research or tackle the rigors of medical, dental, optometry, or veterinary school; the first- and second-year curricula of most postgraduate institutions have a biological basis. This places biology graduates in high demand for both medical school and employment. Earning an online biology degree is a good first step toward pursuing work in both scientific and nonscientific fields. UF traces its origins to 1853 and moved to Gainesville in 1906. UF Online launched in 2014 and offers 20 flexible undergraduate majors in accordance with UF's 160-year tradition of academic excellence. The online bachelor of arts in biology at UF Online provides foundational knowledge of biological principles through a broad, interdisciplinary approach. Students learn about animals, plants, and the building blocks for life through introductory biology, chemistry, and physics classes. Specialized classes allow students to tailor the curriculum to their interests and goals, such as molecular biology, organismal biology, ecology, evolution and diversity, and biology and society. Learners complete general education courses, electives, and a critical analysis of biological research class. During the research class, which serves as a capstone course, students participate in online discussions of research, peer-reviewed publications, and contemporary issues in the field. The online bachelor's degree in biology at UF Online does not prepare students for medical, dental, or veterinary programs, but builds a holistic understanding of living structures, their interactions, and how they relate to real-world situations. UF's online biology degree prepares students for positions in education, allied health, and science-related fields. Students develop knowledge and skills appropriate for careers as medical or veterinary technicians, science writers, pharmacy assistants, and bioinformatics. UF Online offers three start dates each year. Students submit an application, nonrefundable fee, and transcript information for consideration. UF maintains accreditation through the Southern Association of Colleges and Schools Commission on Colleges. Based in Salt Lake City and founded in 1997, WGU offers business, teaching, information technology, and health professions undergraduate and graduate degrees to more than 90,000 learners. WGU offers an online bachelor of science in education degree for aspiring secondary biological science teachers. The program includes 39 courses and leads to teacher licensure. Students complete general education, foundations of teaching, and pedagogy courses alongside classes in general science, health sciences, chemistry, and biology. Specialized courses in molecular and cellular biology, heredity and genetics, human anatomy, and ecology and environmental science prepare students to teach at the secondary school level. Learners participate in field experience classes, and must observe 75 hours of classroom instruction. During a series of supervised teaching demonstrations, learners instruct students under observation from faculty and clinical supervisors. The program also includes a cohort seminar, professional portfolio, and teacher performance assessment for students to reflect upon and demonstrate content, instructional, and planning expertise. WGU's online bachelor's degree in biology allows students to transfer up to 31 credits into the program. Students complete the degree in 16-48 months, enroll in one class at a time, and work through the material at their own pace. Learners who seek initial teacher licensure must pass a state-specific skills test prior to their teaching demonstration. Students may waive some coursework based on previous college experience. WGU's teachers' college maintains accreditation through the Accreditation of Educator Preparation. WGU holds accreditation from the Northwest Commission on Colleges and Universities. Founded in 1971 as a distance learning institution, Excelsior provides affordable, accessible, and collaborative online degrees to adult learners. From its main campus in Albany, New York, Excelsior offers more than 30 degree and certificate programs in business, health sciences, liberal arts, nursing, public service, and technology. Excelsior's more than 36,000 enrollees include over 10,000 active-duty military and veterans. Excelsior offers an online bachelor of science in natural sciences with a biology concentration. The program prepares students for careers in healthcare, energy, and environmental science through a 120-credit curriculum. Students complete 60 credits in arts and sciences and 60 credits of applied professional, elective, and concentration coursework. Concentration classes in microbiology, bioethics, evolutionary biology, chemistry, oceanography, and earth science and society allow students to emphasize aspects of science most relevant to their interests and goals. Students study the theories and principles of science while developing procedures and techniques applicable to the field. Lecture and laboratory studies train students to gather and analyze scientific data. Learners also complete a natural sciences capstone course at the end of the program to demonstrate degree competencies. Excelsior awards academic credit for military training, job experience, and other accomplishments. Learners can transfer science credits earned within 10 years of enrollment into the online bachelor's in natural sciences degree. Excelsior holds regional accreditation through the Middle States Commission on Higher Education. Programs also hold approval from the New York State Education Department. Founded in 1935 in St. Louis, Logan moved to its current 112-acre campus in Chesterfield, Missouri in 1973. Originally a chiropractic institution, Logan continues to offer undergraduate and graduate health science programs to almost 1,600 students. Online degrees include a doctorate in health professions education; master's degrees in health informatics, nutrition and human performance, and sports science and rehabilitation; and a bachelor's in human biology. Logan's online human biology bachelor's degree builds foundational knowledge of science applicable to careers in the health sciences industry. Students also gain the competencies to pursue graduate study in medicine, podiatry, chiropractic care, dentistry, and osteopathy. Learners complete 122 credits of general education, integrated health, and elective coursework alongside core classes in biology, chemistry, microbiology, anatomy and physiology, and physics. Nine hours of integrated health courses present students with information on future trends in healthcare, cultural awareness in healthcare, and medical terminology. Major classes in genetics, biostatistics, and immunology precede a health science capstone requirement. The capstone allows students to integrate coursework, degree knowledge, and experience into a report and presentation on a topic related to their interests within the discipline. Accredited by the Higher Learning Commission, Logan offers classes on a trimester system with three, 15-week trimesters each year. Transfer students may receive credit for work completed at an accredited institution. Logan also awards up to six credits for military training. Students can transfer up to 75% of elective coursework. Founded almost three decades before Arizona became a state, ASU traces its origins to 1886. Today, ASU provides undergraduate and graduate programs to almost 74,000 learners on campus and online, including an online bachelor of science in biological sciences degree. The online bachelor's in biological science program comprises 39 courses and 120 credits. Students complete foundational courses in conceptual approaches to biology, chemistry, and physics before enrolling in 45 upper-division credit hours. Advanced classes in cellular biology, animal psychology, and ecology blend lecture and laboratory content to build knowledge and skills applicable to the field. Students may attend on-campus labs on the Tempe campus or fulfill lab requirements through transfer credits. Learners can take classes in animal behavior, medicinal chemistry, and conservation in practice to tailor the curriculum to their interests and goals. The online biological science bachelor's prepares students for careers in bioinformatics, practical science, environmental protection, teaching, and health services. Learners also gain the competencies to pursue graduate study and medical, veterinary, dental, and pharmacy professions. ASU's online bachelor's program aligns with the competencies recommended for pre-med students preparing for the MCAT, medical school admissions, or graduate study in biology. Applicants submit ACT or SAT scores and transcripts. ASU partners with community colleges and institutions worldwide to facilitate transfer admission. ASU maintains regional accreditation from the Higher Learning Commission. Students who earn an online bachelor's in biology obtain skills related to data analysis, critical thinking and problem solving, understanding and applying scientific concepts, and laboratory procedures. While most schools have similar learning outcomes, the exact details vary. A few examples of the different specializations and courses offered by biology programs are listed below. Microbiology is the study microorganisms and their applications (e.g., in foods, vitamins, genetic engineering, and biotechnology) or roles in disease processes. Depending on your chosen program, this concentration may emphasize general or medical microbiology. Often regarded as the cornerstone of biological sciences, physiology studies the function and nature of living organisms, including humans, plants, and animals, and their parts. Courses may cover subjects such as aging, neuroscience, endocrinology, and reproductive physiology. A zoology concentration provides a broad background in the biology of animals (both vertebrate and invertebrate) in terms of their evolution, behavior, ecology, and anatomy. To ensure hands-on research opportunities, some online programs emphasize fieldwork. The best schools have extensive networks of fieldwork sites to pair students with a zoological organization near their home. Cell and molecular biology: This field unifies genetics, biochemistry, and biophysics to study cells, their components, and how they interact with living organisms. The ultimate goal is to apply this understanding in beneficial ways, such as correcting disease-causing gene mutations. This knowledge prepares you to work as a molecular biologist, cellular biologist, or laboratory technician. Human physiology: This branch of physiology covers major organ systems, such as the endocrine, nervous, musculoskeletal, and respiratory systems, and how and why they function. This class is useful for students interested in working in fields related to health care, government research, and fitness. Ecology: Ecology is the study of natural ecosystems, including the distributions of and interactions between organisms and how these organisms interact with their environments. Ecological principles are key to solving biological and medical problems, such as disease dynamics and biodiversity preservation. This course is especially pertinent to careers in the great outdoors, such as park naturalists, environmental consultants, or restoration ecologists. How Long Does it Take to get an Online Bachelor's in Biology? Most bachelor's degrees in biology require students to complete a minimum of 120 credits, which takes an average of four years. However, several factors affect the length of an online biology program. Many students take advantage of the flexibility and convenience provided by online programing, which allows students to study part-time or at a slower pace; students who go this route can take as many as six years to graduate. Alternatively, individually-paced, asynchronous coursework is great for learners with busy lifestyles or unique educational needs. Self-paced learning also gives you the opportunity to graduate faster. Another teaching method utilizes cohort learning, where students take classes at set schedules with the rest of their class; this helps students who struggle with time management stay on track. Other factors that can reduce the length of your program include previously-earned college credits, which can be transferred to meet bachelor's degree requirements, and whether or not your program offers accelerated coursework, which can reduce the time investment needed to earn a degree. To determine the quality of your online biology degree, be sure to check the program's website for accreditation information. Accreditation means a trustworthy authority has recognized a program's merit in terms of its curricula, faculty, student support services, facilities, and financing. You can find lists of schools that meet these criteria on various agencies' websites. However, it is also important to verify the the purpose and legitimacy of the accrediting agency. Institutions of higher learning can receive two different types of accreditation: regional and national. While national accreditation recognizes particular types of schools (e.g., vocational or religiously-affiliated schools), regional accreditation evaluates institutions based on their geography. Most online schools boast regional accreditation, which is the most widely recognized and prestigious type. It's also worth checking for programmatic accreditation from specialized associations in the biological sciences industry, such as the American Society for Biochemistry and Molecular Biology or the American Institute of Biological Sciences. These are both nonprofit organizations with thousands of members dedicated to advancing biological research and education. Next, check the accrediting agency's legitimacy by accessing the websites of the U.S. Department of Education (ED) or the Council for Higher Education Accreditation (CHEA). These impartial bodies award stamps of approval to accrediting agencies, ensuring that they are qualified to approve schools' methods and standards. You can find databases of accredited schools on the ED's and CHEA's websites. Upon graduation, your annual earnings will depend on a variety of factors, including your specific career path, employer, and professional experience level. Your wages will also depend on your geographic location. The table below shows the five most popular destinations for biology graduates, according to PayScale, as well as the accompanying average salaries. Biology degree online programs cultivate a well-rounded understanding of the physical world and teach students important analytical and critical thinking skills. Graduates with this knowledge have access to a wide range of career possibilities. Depending on your concentration or area of particular interest, you can pursue postgraduate study or begin a career in a biology-related field. You can also enter a nonscientific field, such as sales, education, or law. The list below includes a few occupations you can pursue with a bachelor's degree in biology. Biological technicians assist biological and medical scientists with laboratory tests. To succeed in this role, laboratory experience is critical. Biological technicians can advance to scientist, managerial, or teaching positions after obtaining a few years of experience. Also known as foresters, conservation scientists manage government-owned or privately-owned natural resources like parks and forests. Individuals who concentrate in environmental biology are well prepared for this career. Foresters who hold an advanced degree can move from fieldwork into office-based managerial positions. Geoscientists study the Earth and its composition, processes, and evolution. Students interested in following this career path should enroll in a program that includes geology coursework, field and laboratory experience, and computer modeling and digital analysis. Some states also require geoscientists to obtain licensure. A zoologist (or wildlife biologist) studies wildlife and the interactions between animals and their ecosystems. A bachelor's degree is sufficient for entry-level work, but zoologists who pursue master's and doctorate degrees can qualify for high-level investigative work. Microbiologists study microorganisms and determine how they interact with their environments. They often work in research teams and use a wide range of sophisticated equipment to conduct experiments. Microbiology coursework and laboratory experience are important to enter this field. If you plan to conduct research at colleges and universities, you'll eventually need to pursue a Ph.D. Deciding how to pay for your online bachelor's in biology is an important part of the higher education process. Fortunately, there are several resources available to distance learners to make this easier. First, check to see if your school offers any grants or scholarships; you may qualify for these based on your specialization, financial need, or academic achievements. Also make sure to complete the Free Education for Federal Student Aid (FAFSA) form to determine if you qualify for federal financial aid opportunities.